This guide has been superseded by the Stereoscopic Encoding Guide for Windows Media! This guide explains how to encode stereoscopic video files for playback using Stereoscopic Player or other software players. I assume you have already edited the video in some video editing application and want to compress it efficiently now. First, we have to decide which codec we want to use. 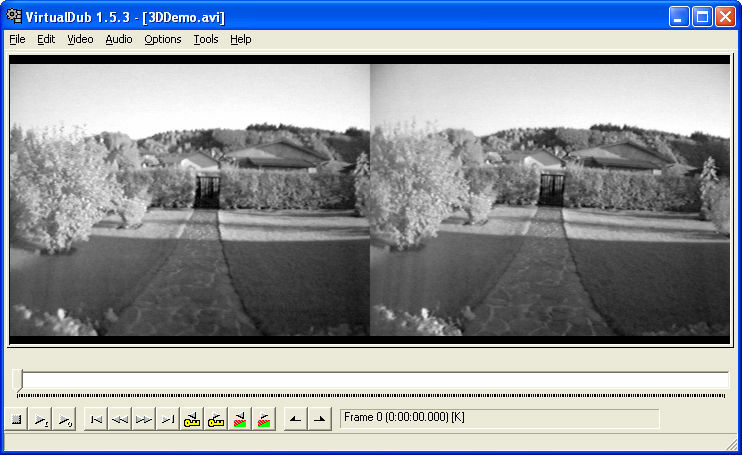 Since there is no free stereoscopic video codec available, we have to use one of the ordinary codecs available. Currently, the most commonly used codecs are DivX and Windows Media. This guide explains how to use the DivX codec only. I wrote this guide using VirtualDub, however you can export directly to DivX format from most video processing applications. By the way, most of the statements in this guide also apply to monoscopic video compression. First, run Virtual Dub and open your stereoscopic video file (File->Open video file). Make sure your video uses side-by-side or above/below layout, because interlaced layout will cause strong ghosting, even when the interlaced-option in DivX is used. Any other layouts are not recommended too, because they are not supported by most player applications, including Stereoscopic Player. The source file should be only slightly compressed, or even better, uncompressed (or compressed using a lossless codec) to get best results. Remember, every time you recompress a video, quality degrades, so avoid lossy compression during editing as far as possible. Never encode videos in anaglyph format! All lossy video codecs use color subsampling (color resolution is reduced to a quarter of original size). Since anaglyphs store 3D-information in the color channel, the video will look blurred after applying compression. Use on-the-fly conversion during playback instead. Select Video->Fast recompress and Audio->Full processing mode or Audio->No audio if your video does not have a soundtrack. Next, click Audio->Compression to select the audio codec. I strongly recommend to use MPEG Layer-3. If you cannot select more than 56kBits/s, you must install an appropriate codec first, for example the Radium MP3 codec. If your source file audio track uses 44100 Hz, make sure to select a 44100 Hz item from the list, if your audio track uses 48000 Hz, select a 48000 Hz item. Some DV recordings use 32000 Hz. In this case, guess what you should select! If Show all formats is disabled, you see only recommended formats for your sound track. There is a bug in the Creative MP3 codec that comes with SoundBlaster cards which causes conversion to hang on frame 9995. Due to the way that audio codecs are enumerated in Windows the Creative codec can even be used though you think you have chosen a different MP3 codec. Disable it or lower its priority in Control Panel, Multimedia so that, for example, the Radium codec is used. Click Video->Compression in VirtualDub and select the DivX Pro codec, then click Configure. Encoding bitrate: Use your desired bitrate, see bitrates. Pre Processing Source: Usually, you should disable this feature. If your movie is very noisy, enable it and select Light. These settings will give the best image quality. Since you can't use DivX for field sequential videos (all other layouts do not work on TVs), it does not matter that you won't be able to play the resulting video file on a DivX-capable standalone DVD player. Click File->Save as AVI and wait until saving is finished. This may take a long time, depending of your videos duration and your computer. Since we have chosen multipass encoding, we have to save the file at least twice. Therefore, click Video->Compression again, select the DivX Pro codec, then click Configure. This time, select Multipass, nth pass. Choose the tenfold of the encoding bitrate as maximum bitrate. Finally, save the video again, using the same filename. Once again you may have to wait a long time. Although it is possible to use more than two passes, it will not improve image quality. After saving has finished, play the file to verify that everything is ok with the file. If image quality is too low, create the file again (repeat all steps), using a higher bitrate. These are suggested bitrates for the most common video resolutions and framesrates. It is recommended to use one of the resolutions in this list. The bitrates are only clues, try out different bitrates to find out what bitrate gives best results with your video.